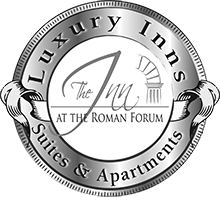 The Townhouse is one of our newest and exquisite offerings at the Inn at the Roman Forum. Located just a few steps away from the main building, guests can enjoy an exclusive private entrance to their own apartment in the historic centre of Rome. The Townhouse is ideally suited for couples or families with two older children. The Townhouse is luxuriously furnished on three floors. On the Ground Floor, guests can have the pleasure to enjoy a dining table, fully equipped kitchen, washing machine with a dryer and a bathroom with a walk-in shower. On the Second Floor, guests can find a comfortable sitting area that includes a lavishly decorated sofa and a flat screen TV, perfect for families to sit and relax after a busy day in the city. The two ample sofas can be used as a sitting area during the day, instead, at night they can converted into two extremely comfortable sofa beds. On the Third Floor, guests can find the master bedroom with a private bathroom including a walk-in shower. In addition, the master bedroom includes a very spacious walk in closet with plentiful coat hangers, drawers and shelves to store your items.